Our most comprehensive London service would be sash windows. We work closely with London Sash Window Repairs Ltd. They are efficient. friendly, honest, and quite frankly apart from the fact that using us directly saves you 15% on their typical costs, you wouldn’t need us to over look any of their work, in fact in most cases they will advise us on best course of action. Finding a trade like this is extremely valuable for us and our clients. On the first job we worked together with London Sash Window Repairs Ltd another company advocated complete double glazed sash window replacement. They came in and double glazed the original sash windows and decorated at less than 30% of the cost whilst producing the very same result and then no additional legal paperwork was created as well. Entire replacement windows would require local planning consent , whereas the upgrade mean’t we were free to go ahead with the works and completion followed within seven working days, quite a contrast to the three month period quoted for entire new windows. So we completed a project two and a half months ahead of schedule and saved our client 70%. Since that day we wouldn’t look anywhere else. Old sash windows rattle and allow nasty gusts of wind to enter the property. 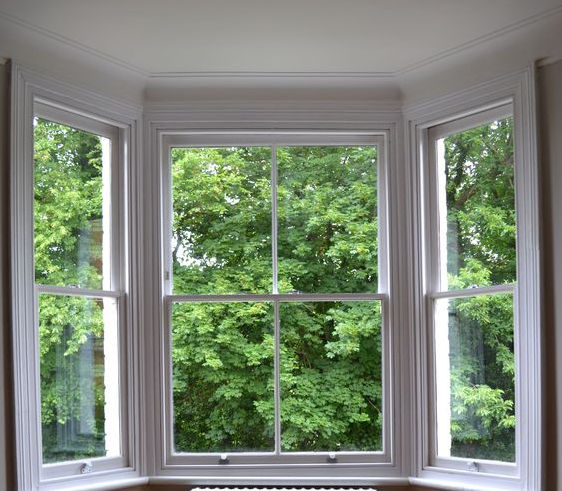 By draught proofing your sash windows we eliminate those draughts, it cuts out the annoying rattling and then improves the thermal efficiency of your window which results in savings on energy. This service normally combines an overhaul and all sash cords are replaced at the same time to provide a complete service in one. This is guaranteed for five years and is often as effective as the first day of installation for up to ten years. Sash window repairs include sill replacement, bottom sash replacement, bottom sash window rail splices, frame splices, and resin repairs. All repairs are spliced and repaired with high quality timber and a resin joint is always created. This way you can ensure that the repair will last and if decorated well not need replacing again for many many years to come. Sash window decoration can often be incorporated into the sash window draught proofing or sash window double glazing services. If your restoring and refurbishing your sash windows then it makes sense to decorate your sash windows at the same time because you have complete access to the frame. This means that we can decorate behind the window which will create a better seal against damp and further decay. Sash window double glazing is a core of our services. We normally look to double glaze the original sash window first because this can save significant amounts of money. If the sashes are to thin to double glaze the existing then we will manufacture new replica sashes that can be installed into the original frame. We typically use Pilkington low-E units which have now stood the test of time and no better technology has replaced in ten years. The units are Argon filled to create a cavity that will not allow heat to pass and therefore increasing the efficiency of the sealed unit. For a more extensive look at sash window double glazing I recommend taking a look directly at their website as the detail is considerable and all facts and figures can be found. This provides savings over entire replacement and negates the need for building consent unless you live in a listed or conservation area of London.